Hill Crest Country Guest House015395 31766work Guest HouseHill Crest nestles in a small village just outside of Newby Bridge with amazing countryside views and lovely woodland walks straight from our door. All rooms are individual and beautifully decorated with a well stocked tea tray and home made biscuits, hairdryer, organic toiletries, dressing gowns and slippers. Everything you should need to make your perfect stay. Hill Crest is ranked as number one in this area with 'Trip Advisor' and Winner of 2 awards with Cumbria Tourism - 'Outstanding Customer Service' and 'Guest Accommodation of The Year'. So, you will be assured a very warm, friendly and hospitable welcome. I am passionate about my business and I’m always on hand to help you make the best of your stay. If you haven’t visited the area before I will make up bespoke itineries for you. Begin your visit to this traditional Lakeland house with tea and delicious homemade scones. Be spoiled further with our highly recommended breakfast, sourced where possible from local Cumbrian producers. A large selection of healthy starters, a hearty English breakfast to a lighter option, my varied menu giving you lots of choice. Menu on my website. 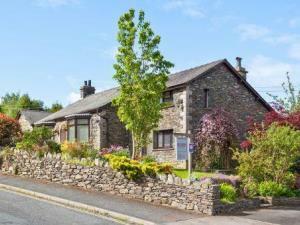 Only a few minutes drive from the bottom of Lake Windermere, you have the Lake District and the Furness Peninsular at your finger tips. From local walks to an abundance of top local attractions for all the family. Haverthwaite and Lakeside steam railway, the Motor museum, steamers on the lake, the Lakes Aquarium, Fellfoot Park, Cliff Hanger puzzle rooms, Holker Hall and more. Activities a few minutes away: horse riding, fishing, clay pigeon shooting, archery and Go Ape in Grizedale. Cartmel only 10 mins drive also has a lot to offer, with Michelin star restaurants, a micro brewery, the Priory and the famous Race course. In the local area there are a selection of eating houses for all occasions: from traditional country pubs to fine dining restaurants. Ulverston also has a good choice of restaurants, less than 10 mins drive away. Quote from a guest -‘Jane will go that extra mile to make your stay perfect, she looks forward to welcoming you and making your stay a memorable one’.